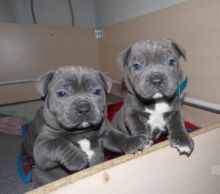 One boy and one girl* available I have for sale 2 Staffordshire bull terrier puppies. 1 Boy and 1 girl all blue not the faded blue that is renowned for health problems. All my puppys are home reared around a loving family and socialised with children. All my pups will be ckc registerd, micro chipped wormed, flea treatment also a puppy pack with puppy treats, food, blanket and toys. $350 deposit secures a pup of your choice. Text On ( 204) 817-5731 ) Or E mail me on (paulhulk789@gmail.com )If really interested.